The Rev. Jonathan Schriber delivered his last sermon as pastor of St. John’s Lutheran Church in Sidney, Ohio, on Sunday, Jan. 27, 2019. SIDNEY — The Rev. 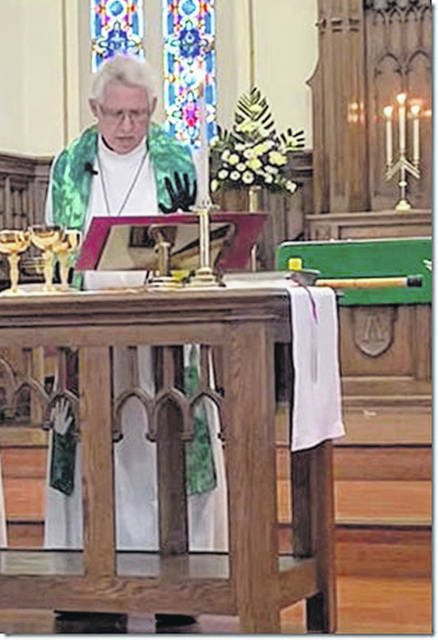 Jonathan Schriber delivered his last sermon as pastor of St. John’s Lutheran Church in Sidney, Ohio, on Sunday, Jan. 27, 2019. The special day was celebrated with a baptism, two first communions, greeting of new members, choirs, instrumentals, and a congregational lunch served at the neighboring Sidney Senior Center. After 40 years, Schriber – aka Pastor Jon or PJ – looked at the calendar (he just turned 66) and decided that his wife, children, grandchildren and train hobby were calling to him. A congratulatory address and parting gifts were presented by Church Council President Steve Holt at the church service and Senior Center luncheon. Highlights of Schriber’s service to his congregations were shared. Invited guests included the Schriber’s children and families, past Associate Pastor the Rev. Rich Genzman and wife Karen, past Visitation Pastor the Rev. David Buchenroth, current Visitation Pastor, the Rev. Cheryl Siegenthaler, and the Rev. Charla Grieves, pastor of St. Paul Lutheran Church in Botkins, Ohio, and many past and present members of St. John’s. In short, spread the Word; tell them like it is, tell them how they should behave; tell them what is needed, not necessarily what they want to hear. St. Paul was speaking directly to Jonathan Schriber. By his own admittance, Schriber was an ornery kid, better than most perhaps, but not as good as others. However, as Schriber grew in his family and his church (Faith Lutheran in Massillon, Ohio), he knew in his heart that service to his Lord was tugging his thoughts. After graduation from Fairless High School in Navarre, Ohio, in 1971, Schriber enrolled at Capitol University in Columbus, Ohio, declaring a major in speech and drama. It was during these years that Schriber met and fell in love with Gaile Lasch, his future bride and mother of their children. After receiving his bachelor’s degree from “Cap” in 1975, Schriber prayerfully elected to attend Trinity Lutheran Seminary at Capital University. It was there that Schriber consecrated his love of God and devoted his life to congregational ministry. He and Lasch were married in 1976. Upon conclusion of his internship with supervised congregational experience in 1979, and having survived grueling years of study, passed the tests and waited for the telephone to ring, Schriber received a formal call to serve as associate pastor at First Lutheran Church in Rugby, North Dakota. Jonathan Wilson Schriber was awarded his Master of Divinity degree on June 3, 1979, and was ordained at Massillon, Ohio on June 10, 1979. The new minister and his bride loaded up and headed west to The Geographical Center of North America, population 3,335. So, we know the beginning. The congregation celebrated the end of the Rev. Jonathan Schriber’s ministry at Sidney St. John’s Lutheran Church: March 1984 – January 2019. But what of the intervening years, the “–” (dash) between 1979 – 2019? Schriber faithfully served the Rugby congregation for nearly five years. As an associate pastor of this very large congregation, Schriber, and his wife, learned the rigors of ministerial life. Still, with both their families located in Ohio,the couple, along with their first children – Amy and little brother Jonathan – felt a longing to be nearer to their parents’ homes. Schriber received a call in early 1984 from St. John’s Lutheran Church, in Sidney; St. John’s needed an associate pastor. Accepting the position, Schriber began his duties in March 1984. First as associate, and later, as senior pastor, Schriber would give nearly 35 years as spiritual leader to the congregants at 120 W. Water St. in Sidney. In those 35 years, Schriber would be a busy man: husband, father, minister and teacher. Their family grew to six, first with the birth of Joshua and then the birth of Molly. Music and athletics consumed “free” time. Amy would marry and move to Texas and become the mother to three of her own children. Jonathan joined the Army, served two tours in the Middle East, married, lives in Monroe, Ohio and is the father of one. Joshua lives in Cincinnati and Molly lives in Sidney. The Schriber family, including son-in-law and daughter-in-law, now stands at 12! There are always hallmark events, for Schriber, two stand out: the joy PJ has when presenting newly baptized Christians to the congregation and the six members of St. John’s that have gone on to become ministers of God’s Word. • And received one kidney from his wife! Good man, good servant, good leader, staunch friend; fearless in the pulpit … purpose driven Lutheran and devout Christian. The Rev. Jonathan Wilson Schriber understands and preaches that eternal salvation is through the grace of the Lord.